This tender but matter of fact film was made by Rabeya, Sopna and Dadon of the ‘Out of Focus‘ group. These three children can relate to the life that Shima leads. The film was awarded the Meena Award by UNICEF for the best film in the ‘under 18s’ category. Though their basic photographic skills were developed by Drik, Laurent van Lancker of Polymorfilms introduced them to film making. 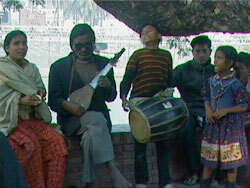 Lokman is young street singer, whose talent is widely known in the neighbourhood. He lives in a slum and his accompanying musicians are his parents, who depend entirely on his singing talent as their source of revenue. The constant performing on the street prevents him from going to school regularly. Great post guys! This is exactly what I am looking for. You were very helpful.